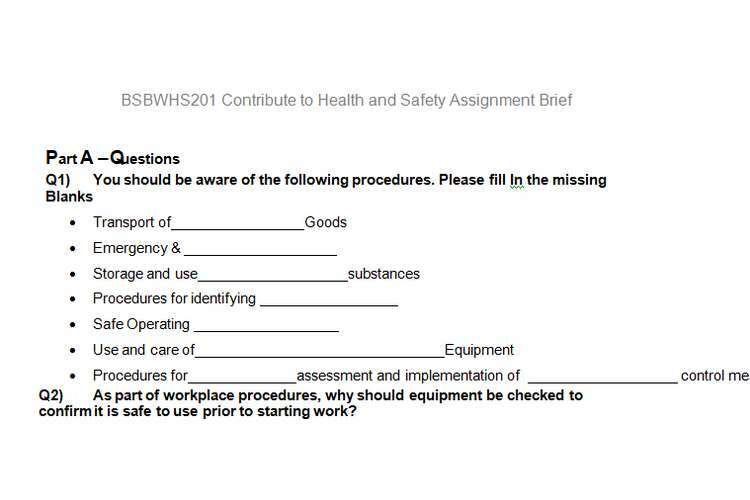 Q2) As part of workplace procedures, why should equipment be checked to confirm it is safe to use prior to starting work? Q3) Briefly explain your workplace procedures to responding to an emergency. Q4) Who would you raise any WHS concerns with in the workplace? Q5) Give examples of the following major Hazards. Q6) How do you record and report an incident or hazard within the workplace? Q7) List the title of one duty holder in the workplace and give a brief description of their role. Q8) As part of the WHS consultation process why should regular meetings be held and any issues reported and recorded? Q9) Name one workplace hazard and how you would remove that hazard. Q10) When using personal protective equipment (PPE) why should you ensure it fits correctly? Q11) Briefly describe the difference between a hazard and a risk. Q12) Why is it important to be able to identify and follow warning and safety signs? Instructions: Look at the picture and list 5 hazards you can see in the table provided. In the second column write how you can make the environment safer. Instructions: Locate a piece of equipment or machinery in your workplace or learning environment. List any safety or prestart checks that you would conduct before operating the equipment and who it is reported to. Instructions: the following tasks are to be carried out following all workplace health and safety policies and procedures.